This article is reprinted here with the kind permission of the author. It appeared on the weblog Shouts in the Piazza. It seems a relatively safe assumption that anyone even remotely connected with the Church has heard of Advent. However, it is an equally safe assumption, unfortunately, that most people do not really understand what this season is about. Squeezed as it is in between various holidays in a "holiday season" that now seems to begin with Halloween it is often completely overlooked. How sad that this season of joyful anticipation which commences the liturgical year is often shunted to one side in the hustle-bustle of shopping, baking, wrapping and partying that precedes Christmas. Why folks feel that it's necessary and/or appropriate to have Christmas parties before Christmas and then spend the Christmas season doing nothing is beyond me. Yet that seems rather commonplace these days. We wind up spending all of Advent celebrating Christmas and then spend Christmas (which is a season not a day) taking down the decorations which many of us have had up since before Thanksgiving! Now, let me be clear about one thing. I realize that in the realm of the secular world the battle is all but lost. Any trip to the mall in early October will indicate to you that the holiday season is already upon us and the graveyard of Christmas trees that line many American streets by December 27th is sufficient evidence that Christmas is over for another year. That may be the case "out there," as it were. I learned long ago just to accept the fact that Advent is a dead issue outside the confines of my church. Nevertheless, what happens inside the church is an entirely different matter. I'd like to suggest we do what we can to remember and revitalize this forgotten season. If nothing else then Advent will be a liturgical experience. This kind of effort isn't required in Lent. People seem to have no problem allowing the Lenten observances to spill over into their everyday lives all throughout that other season of preparation. Since the world and all its concerns so overbearingly dominate the weeks leading up to Christmas, however, we need to make a much stronger effort to ensure that the fullness of the liturgical year finds an expression in our worship. The word "Advent" means the arrival and we should use this all too brief four weeks to prepare not only for the commemoration of the Lord's first arrival but for His continued arrival in our lives and in our hearts. In the Western Church it is separated into two stages. The first runs from December 3rd through December 16th. The second, from December 17th-24th focuses attention more on the feast of Christmas. The two prefaces of Advent used in the Mass highlight each of the two stages. Advent, like Lent, is a penitential season. Unfortunately, over the course of time much of the penitential character of the season has been lost. Nevertheless, the Church always encourages the use of acts of penance as a means of preparing for any great celebration. Just as anyone will clean their house in preparation for hosting a party or other large celebration so, too, should we spiritually clean house as we prepare to renew our celebration of the Incarnation. Despite the downplaying of the penance involved with Advent the evidence of this important aspect of the season still abounds. 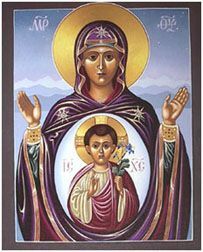 The proper liturgical color for Advent is violet (purple). While it has often become customary to wear blue in many places, strictly speaking, this should be avoided. This is so for two reasons. First, blue has never been approved as a liturgical color for use in the Roman Church. The local Conference of Bishops does not have the authority to sanction this in contradiction of the universal liturgical instructions given by the Holy See. Second, the use of blue is often defended specifically as a means of downplaying or eliminating the penitential character of Advent! This is misguided. Often it can be heard that we wear blue because, "...Advent isn't a season of penance like Lent is." That simply isn't true. On the third Sunday of Advent (Gaudete Sunday) the liturgical color is rose. It's the day that I always feel like a bottle of Pepto-Bismol. The use of rose as a liturgical color is customary but not mandatory. If it is decided not to use rose then violet is used throughout the season. One solution that has been proposed by the bishops of the U.S. with the approval of the Holy See is to make use of the darker shades (true violet) during Advent and reserve the so-called "Roman" purple (which has a redder hue) for Lent. This solution seems to me an effective means of drawing a distinction between the two seasons without violating the rubrics. It should be noted that even in places where blue is incorrectly used for Advent the color for the third Sunday is still rose. Further evidence of the penance of the season may be found in the liturgy. The Gloria is omitted throughout Advent. In addition, as in Lent, the use of the organ and other musical instruments should be severely restricted and primarily for the purposes of sustaining the congregational singing. Exceptions to this would occur during extra-liturgical celebrations, exposition and benediction of the Blessed Sacrament, mass on feasts and solemnities (such as the Immaculate Conception) and on Gaudete Sunday (the third Sunday of Advent). Likewise, altars and sanctuaries should not be decorated with flowers during Advent. [See *Editor's Note below.] That may not seem like such a big deal until you take into account the ramifications of such a custom with regards to weddings that may take place during Advent. In many churches weddings simply aren't permitted in Advent. However, in places where they do occur the couple getting married needs to be catechized as to the character of the season and the limitations that will place on the liturgy celebrating their matrimony. Another exception to the custom concerning flowers takes place, again, on Gaudete Sunday. This day, which reminds us to rejoice in the midst of our preparations, serves the same function as the fourth Sunday of Lent, also known as Laetare Sunday. A genuine effort should be made to relax the penitential and anticipatory atmosphere in the liturgical celebrations of Gaudete Sunday. However, if the organ has been going full guns and there have been flowers all over the church throughout Advent then the exceptions for Gaudete Sunday become devoid of meaning and really almost comical. "Moderation should be observed in the decoration of the altar. During Advent the floral decoration of the altar should be marked by a moderation suited to the character of this time of year, without expressing in anticipation the full joy of the Nativity of the Lord. During Lent it is forbidden for the altar to be decorated with flowers. Exceptions, however, are Laetare Sunday (Fourth Sunday of Lent), Solemnities, and Feasts. Floral decoration should always show moderation and be arranged around the altar rather than on the altar table." Flowers, in moderation, are appropriate during Advent. Less decoration outside of Gaudete Sunday seems advisable, although not required by the rubrics. Another well known but misunderstood feature in Advent is, of course, the Advent wreath. This custom, originally from Germany, began as a family observance for use in the home. It is always a wreath, preferably of real greens, with four candles representing each of the weeks of Advent. While all four candles may be white, or red decorated with colored ribbons it has pretty much become the custom to use three purple and one rose colored candle. There seems to be a tendency to make more of the Advent wreath than is necessary. It is not the Christmas equivalent of the Paschal Candle. Thus it does not need to be placed near the ambo (as in the case of the Paschal candle) nor, indeed does it even need to be in or near the sanctuary at all. In many places the wreath is suspended from the ceiling. Likewise, it is also perfectly appropriate to place the wreath in the narthex or gathering space of the church. Keep in mind that it is not truly a liturgical item. It is an item intended for use in the home which has been transferred to liturgical use. Therefore, it need not receive an undue amount of prominence. In addition, the Advent wreath should be blessed only once. The custom of blessing it at all the masses on the first Sunday of Advent or of re-blessing it on each Sunday of Advent should be avoided. What does this say about the blessing which is given? Once something has been blessed it has been blessed. What purpose is served by blessing a wreath that has already been blessed? The actions of the liturgy are not pantomimes which we perform for people to see. It is not a theatrical presentation that must be repeated over and over for each "performance." This kind of thinking does a great disservice to the liturgy and allows our worship to devolve into empty gestures. Let the liturgy be real."" The wreath is blessed at the first liturgy of the First Sunday of Advent. If we do not feel it necessary to remove the Eucharist from the tabernacle and re-consecrate it at a successive liturgy then, likewise, we do not need to bless the Advent wreath repeatedly. Once Advent is over the wreath should removed entirely from the church. It is most inappropriate to switch all the candles to white and have it become a "Christmas Wreath." As it is now having the wreath in the liturgy at all is a bit of a stretch. Don't stretch it further into the ridiculous by using an Advent symbol in the Christmas season. As I said before it is not comparable to the Paschal Candle. When Advent goes away so does the wreath. One good thing that parishes can experiment with for Advent is making use of the Liturgy of the Hours for special services. In my first parish assignment we started to have Evening Prayer (also known as Vespers) on the Sunday evenings of Advent. The entire service only lasted about thirty minutes and included a homily. It was rather successful precisely because many people felt that Advent zooms past so fast that they never have time to make a spiritual preparation for Christmas. In all the frantic activity it is impossible for many people, especially those with small children, to find time for prayer and reflection on their own at home. However, many people did find it possible to spare a half-hour on a Sunday evening four weeks running. Many of them would comment to me that they valued these brief experiences of prayer because it exposed them to the Liturgy of the Hours for the first time and it made them feel, albeit in a small way, that they had done something to prepare themselves spiritually for Christmas. Even if a parish's resources prevent scheduling Evening Prayer for all four Advent Sundays it might be nice to attempt to have it at the very least on Gaudete Sunday. This would also serve the dual purpose of, again, drawing some special attention to this third Sunday in Advent. Advent is such a short season and its limited time is infringed upon mercilessly by the ever-encroaching commercialism and materialism of what the world outside the Church generically refers to as the holiday season. Nevertheless, it is a beautiful time rich in symbolism and overflowing with themes of anticipation, watchfulness and joy at the Incarnation of our loving God. In the first part of Advent we celebrate the two comings of Christ; His once and future advent. In the second part of the season we fully celebrate Him whose coming was foretold by the prophets and heralded by John the Baptist and who was borne by the Virgin in her womb. We should make every effort, at least in our liturgical lives, if not in the entirety of our lives to see to it that it never falls by the wayside as the forgotten season. Fr. Guy Selvester is a priest of the Diocese of Metuchen, New Jersey, an Oblate of Saint Benedict, a trumpeter and a heraldic designer. His weblog may be found at Shouts in the Piazza.